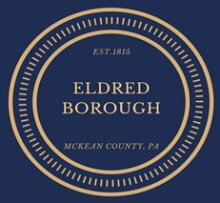 The Eldred Borough, 3 Bennett Street, Eldred, Pennsylvania, is the city government office for Eldred. Home of the Kendall Bridge, also known as the Allegheny River Viaduct Junction of Routes 346 and 446. The Kendall name comes from locals in reference to the longtime Kendall station located directly at the entrance of the bridge. Kendall Bridge crosses over railroad tracks, a secondary road, and the Allegheny River. During World War II, Eldred was the site of a British and American munitions plant that produced eight million bombs, mortar shells and fuses. The Eldred WWII Museum opened on Memorial Day in 1996 to honor those who fought in the war and those who worked at the plant.